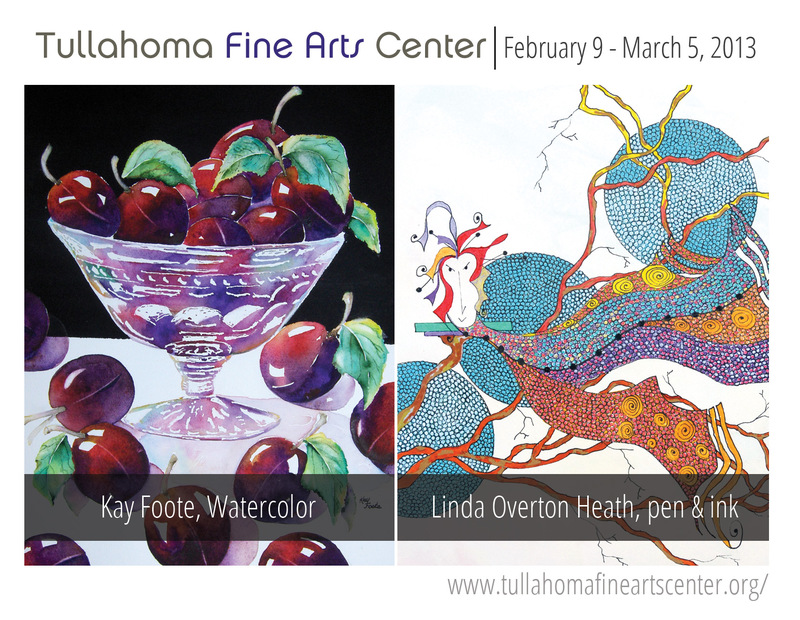 Linda Overton Heath, one of our own members, had an art opening at the Tullahoma Fine Arts Center along side watercolorist Kay Foote in February 2013. Linda is a pen and ink artist and her work is exquisite! Heath refers to her father as her best friend and credits him with fostering her interests in music and art. Mr. Overton frequently took his child to the Royal Pavillion and the Library in Brighton, where she became entranced with Asian wood block prints, textiles and ceramics. When she was seven, her father took her to a performance of Madame Butterfly in London, which began her lifelong love of opera. The Overton household was a stimulating environment for a child, for Mr. and Mrs. Overton filled their lives with many creative, intellectual and multinational friends and relatives. In particular, Ms. Overton Heath recalls the influence of two of her uncles: Jack Fell, a british Ambassador to Argentina and later Spain, and James Fell, a poet who worked with Sir Lawrence Olivier. By the age of five, she had already begun to exhibit a remarkable artistic talent, recognized when she was asked to paint a Crucifixion themed panel to be exhibited at St. Martin Church which was blessed by the Archbishop of Sussex. Two years later, while enrolled at the Elm Grove School for Girls, one of her drawings was collected and exhibited by the London Art Gallery. The Brighton College of Art accepted Ms. Overton Heath when she was fourteen years old; her father passed away three months later, an event which devastated her. She studied at Brighton College of Art for four years, focusing on applied technique and developing an interest in portrature. After her graduation, she studied for six months in Frankfurt, Germany. Shortly after she returned to Britain, she emigrated to the United States. She married and turned her creative energies to raising her two daughters and volunteer work. In 2005, Ms. Overton Heath returned to artwork for her own pleasure and sanity, as a form of catharsis during a difficult time in her life. Her style, which she calls “Oriental Contemporary”, is very different than her work prior to her marriage. While she has very little knowledge of art history, she believes that her trips to the Royal Pavilion with her father many years ago planted the seeds for her current body of work. Ms. Overton Heath has only recently begun publicly exhibiting her work. She did not realize there would be an interest in her work until friends pressed her to enter an art show in Huntsville, Alabama where she won an award. That coupled with an overwhelmingly positive public response convinced her to give her work a broader audience.